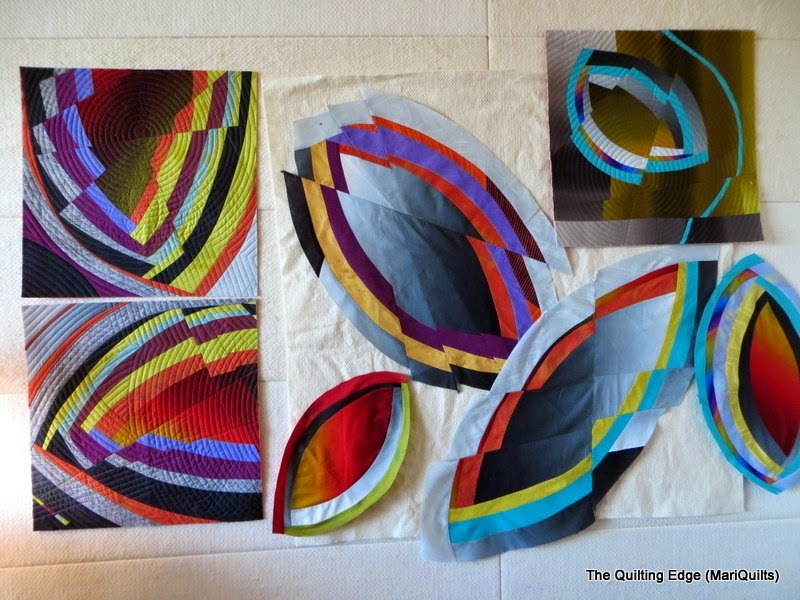 Last winter, I volunteered to be a tester for Sherri Lynn Wood's upcoming book, The Improv Handbook for Modern Quilters. I enjoyed my experienced immensely...except for the fact that I couldn't share my process with you, along the way. But good news....I am free to do so now. Rest assured I took plenty of pictures along the way. To quote the book description on Amazon; "Instead of traditional instructions, she (Sherri Lynn Wood) presents 10 frameworks (or scores) that create a guiding, but not limiting, structure." All of the testers received one of the 10 scores. When I received the "Bias Petal" score....a little panic ensued. Why you might ask? Well, did the improv part unnerve me? No, not in the least...I have been having my own love affair with improv for some time now. What about the curved piecing or bias strips?? No, not really, curved piecing and I are old friends. What was it then?? The word PETAL....yes, the word PETAL!! Nothing personal...but, but, but I don't do flowery petal type things!!!! Yup....that knocked me right out of my comfort zone....probably a good thing. Then I cut meters upon meters of bias strips (after all, I wanted variety). I still have plenty of those strips sitting around for more projects. Whenever working with anything on the bias.....bubbles and puckers can be a problem.But, Sherri Lynn has plenty of little tips to combat those pesky bubbles. My secret weapon is spray starch!!!! I made several petals....and just kept putting them up on my black design wall. I used several gradient type fabrics and mostly solids or tone on tone fabrics. I decided to shatter the petals.....somewhere along the process, I stopped thinking of them as petals. I shattered them by slicing through the petals (using my rotary cutter) and shifting them a little and sewing them back together. The back of a shattered petal. The shattering......created a different effect. I took one look at the wall and the question that kept running through my head was.....how in the world am I going to put this all together into one piece??? I was determined to do it all by machine.....no hand sewing whatsoever. As you can see, I started quilting sections, with no idea where this was going. And of course I threw in a little QAYG (Quilt as you Go).....and there you have it. The exciting part of working this way is that the ideas sort of start exploding along the way. Well, it is fabulous. I agree about the petals thing, I would not like that word either! But your take on it is nothing less than spectacular! And the light blue and purple fabrics almost glow! It looks like a pretty tough sew...but the end result is perfection! Thanks, Carrie......it really wasn't all that tough. Oh, your quilt is beautiful! I was lucky to receive the "String Score". But, might have to try the Petal Score. Wonderful! So glad you can finally share it with us!!! These are fabulous! I like the effect the shattering gives oooooh I am going to have to give this technique a try. Off to check out the book - thanks! Ha! that's funny that the "petal" threw you off balance. That's fantastic! It's an amazing piece. Truly unique and all your own. I can't wait to see it in real life at QuiltCon. Thanks Marianne! Fabulous quilt! Can't wait for more info about your methods! So very inspiring!! That's a spectacular quilt!! Thank you so much for sharing the technique with us!! I've never dared to give improv quilting a try, but your "tutorial" encourages me to have a go at it! This is so exciting to see! Thanks for sharing. Wonderful. So glad you are back and with such exciting news. Congratulations!! I look forward to many posts filled with color! You've definitely stepped it up a notch and into an entirely new realm! Excellent! I just love this and all you shared about the process. I guess I have a question about the bias. why? I know you have sliced and sewn curves before but why not do that on the petals too? Is bias strips really necessary to get the beautiful effect? Did your quilt get picked for the book? The quilt has a prismatic effect with the fractured pedals and the fabric you used. It is gorgeous! I participated, but none of my three pieces were accepted. The thing that still bugs me is using the word score. Trying to use this term to describe what the author was attempting just didn't work for me. Oh, gorgeous. I pre-ordered this book back in December and this post is making me even more excited to get it. Thanks.....I'm reallly looking forward to the book as well. Beautiful and what an impact! I'm excited to see more! Wow! I love the shattered effect. Thanks for sharing about your process. Now I'm waiting to see what you do with the rest of those bias strips. Did you get into the book? Very cool, and impressive, and inspirational. Thank you for sharing. So, so, so well done!! It's just so awesome! Great job. I am loving the movement it has. OH. MY. GOSH!!!! This quilt is phenomenal. I could never create something so free and dynamic and stunningly beautiful in its color play on my own, and I seriously doubt I could do it with help, either. ;D Fantastically done, Marianne! I'm sure she was blown away and beyond thrilled when she saw what your "pattern testing" produced! I love how, no matter what technique you use the end result always looks like your work, unmistakably yours. Beautiful piece. Do you plan to use this technique again? Your improv quilt is stunning & I love the shattered effect, congrats on a fantastic end result after the initial "petal" trepidation! Such beautiful improvisation. Your gradient fabrics are so effective. In places, they really add a three-dimensional air. Thanks so much for sharing your process. This quilt is fantastic. The method unique. I will look for this book. Love your quilt and this site, which I have just recently joined. I also love the idea of improv but have been doing traditional for many, many years and the fear of randomly cutting into perfectly good fabric or pieced items. YIKES!!!! Thanks so much.....but like you I'm not one to follow a pattern either. You have outdone yourself, Marianne! Kudos! Thanks Dianne.....the quilt is NOT in the book but will be at Quilt Con. Marianne, I'm in awe with your quilts. They are ART. and I'm hope give a try to QAYG with your wonderful tutorials. Oh my lord, this is just stunning. You never fails o amaze me. Love the shattered look! 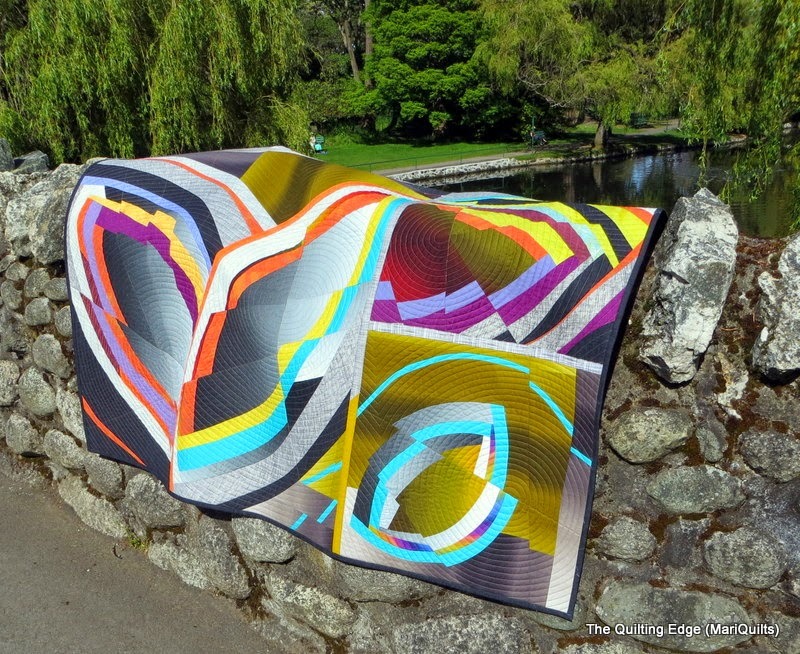 This quilt is so completely you, and yet it looks unlike anything you've done before. How do you do that?! 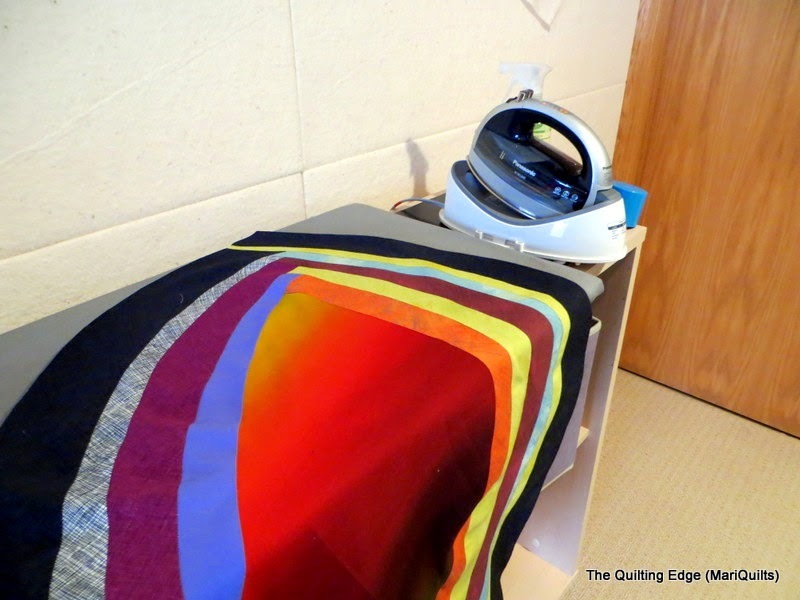 It shows how a good "guidebook" can influence a good quilter without losing the quilter's voice. All of that aside, I just love this quilt. The colors, the ombres, the greys, and best of all, the jagged edges that still somehow flow smoothly in the petal shapes - it's spectacular. It's amazing and I always love a process with no definitive plan until it just happens. great quilt. colour and the shape. so much you can do with it. I always admire the color and movement of your work - and these petals are phenomenal! Thank you for sharing the process that led to the creation of your magnificent petal quilt. It 's stunning. You never fail to inspire me with your creative approach to design and construction. Can't wait to see this quilt - and you! - at Quiltcon. What a spectacular, eye-catching piece--it's always such a pleasure to see your work! Oh wow! I really, really like this. I'm not sure it is something that I'd ever attempt but I can sure appreciate what you've created. Nicely done. What a fantastic quilt. Love the use of the graduated ombré fabrics. They are hard to get here in New Zealand. Do you buy yours online? Very fun to read about your process!